The photos are unsettling, depicting years of humdrum, everyday life framed through the lenses of unendingly suspicious watchdogs. 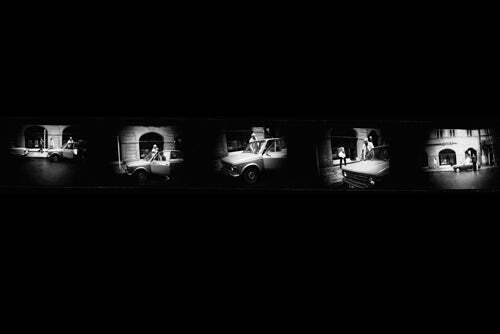 “Prague Through the Lens of the Secret Police,” at Harvard through Dec. 21, is an exhibit of spooky images from the 1970s and 1980s. They depict the “normalization” period in Czechoslovakia, an intensely repressive interval between the Soviet-led crackdown in 1968 and the collapse of Communist rule in 1989. The exhibit, at the Center for Government and International Studies, consists mostly of banner-size photos and text cards translated from Czech. There are also six minutes of looped video. In one scene, filmed with a hidden camera, a man simply eats an apple. “From now on, when I eat an apple, I’m going to be watchful,” said Mark Kramer, a fellow and director of the Harvard Project on Cold War Studies, part of the Davis Center for Russian and Eurasian Studies. The exhibit is from the Institute of Totalitarian Regimes in Prague, where a related Security Services Archive opened last year. The show’s first U.S. stop was the Woodrow Wilson International Center for Scholars in Washington, D.C. Its second is Harvard. Kramer has worked extensively in the Czech police archive. Stored end to end in file cabinets, he estimates, are more than 30 miles of documents. Czech authorities say it will take a decade to digitize all of that paper, microfiche, film, and photography. Similar archives are open to the public in most former nations of the Soviet-controlled Eastern Bloc. But the Czech archive, established by law, is the freest and most accessible, said Jiri Ellinger, first secretary and head of the political section at the Embassy of the Czech Republic in Washington, D.C. At Harvard, he spoke at an opening reception Nov. 15 to a crowd of about 150. 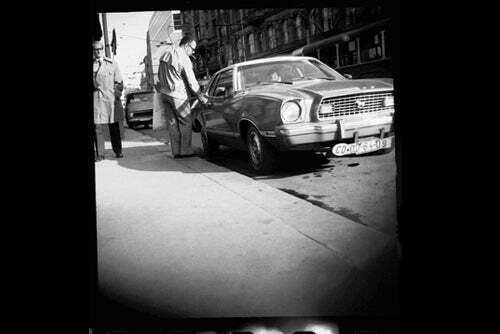 A one-of-a-kind exhibition of photographs and films taken by the surveillance unit of the Czechoslovak secret police in the 1970s and 1980s, “Prague Through the Lens of the Secret Police,” is on display at Harvard’s Center for Government and International Studies through Dec. 21. This is the second stop in the exhibition’s U.S. tour. 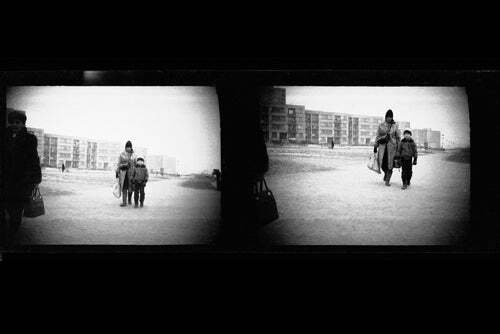 One of the exhibition’s aims is to show those who never experienced life in a Communist dictatorship what the secret police actually did at the behest of Czechoslovakia’s Communist regime. 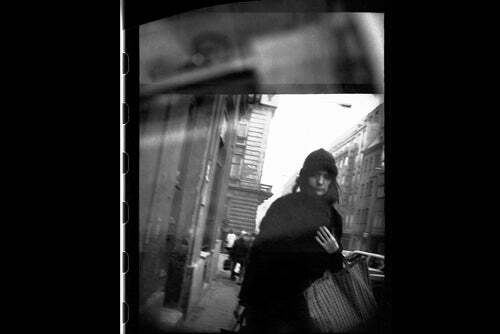 The camera was hidden under a coat, in a suitcase, or in a handbag. 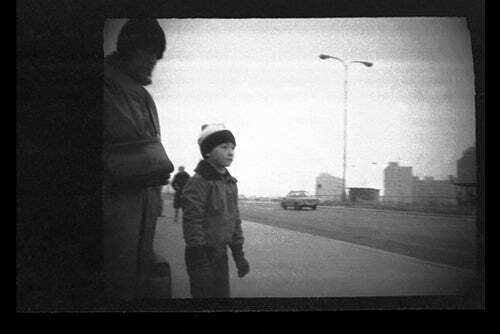 The Communist secret police would release the shutter at moments when they felt the subject was in front of the hidden lens. 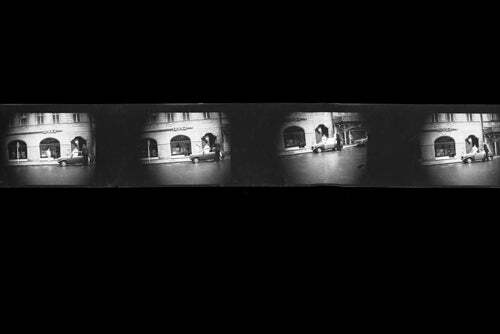 These never-before-seen photographs and films of “subjects of interest” were taken secretly during the “normalization” era of hard-line socialist entrenchment after the 1968 Soviet-led occupation of Czechoslovakia, according to the exhibition notes. “Prague Through the Lens of the Secret Police” introduces the visual products of the activities of a special unit of the Communist secret police (Státní bezpečnost, or StB) – the Surveillance Directorate of the Interior Ministry – which carried out surveillance of Czechs, Slovaks, and foreigners whom the Communist regime deemed hostile or suspicious in any way. The secret shadowing of designated people was carried out by about 200 policemen. The officers’ most commonly used exposure time was 1/125 of a second and often even 1/60 of a second. The people in the pictures could not speak, read, or gather freely, he said. And the people taking the pictures thought of citizen surveillance as normal. The exhibit begs the questions: Who were these unintentional artists, whose photos can move onlookers years later? 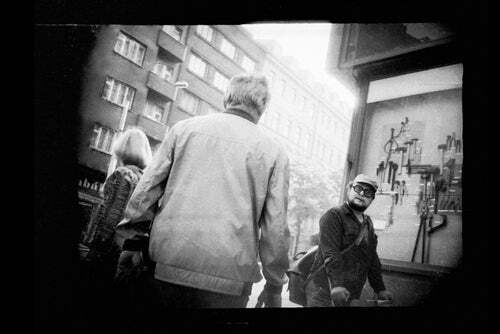 Who were these secret-police officials, whose naïve pictures — taken without aid of the human eye from satchels and pockets — evoke so vividly the drab Prague of the Communist era? In 1948, when Czechoslovakia became a Communist state, there were 14 men in a special police unit who were spying on citizens. They had only one camera. 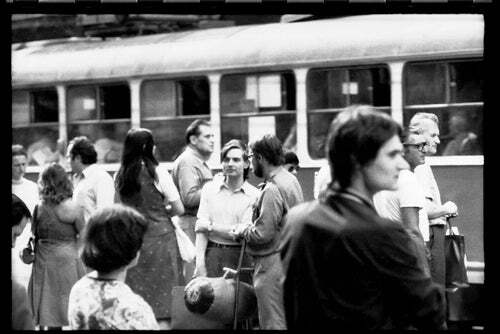 By 1989, just before the Velvet Revolution transformed the Czech Socialist Republic into a democracy, 795 men and women were in the Surveillance Directorate of the State Security Service. These domestic spies embraced a James Bond modernity. They used many cameras — concealed in tobacco pouches, purses, briefcases, transistor radios, lighters, and on engine blocks (for mobile surveillance). They mounted Sony television cameras in parked cars and in a baby carriage wheeled around by operatives posing as married couples. They ran up tabs for meals and beer. All was carefully archived, including deadpan written reports that read like postmodern fiction. 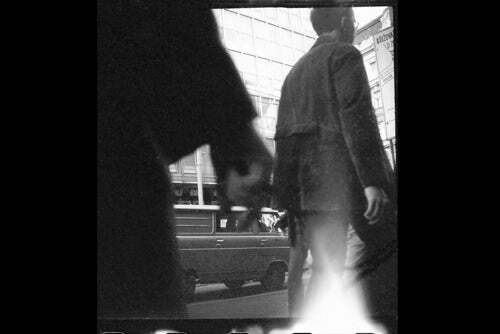 Surveillance was often layered, professional, and constant. By 1989, police spies had amassed more than 7,000 files on civilians. They gave their operations code names with novelistic resonance, including Rome, Tennis Player, Bula, and Condor. They nicknamed their surveillance subjects with similar verve: Alice 83, Smoke, Typist, and Aloe, for instance. Producer 1, tailed from 1982 to 1989, was filmmaker Milos Forman. Doctor A — bespectacled, bearded, and on crutches in the exhibit photos — was Zdenek Pinc, a Prague professor of ancient philosophy.